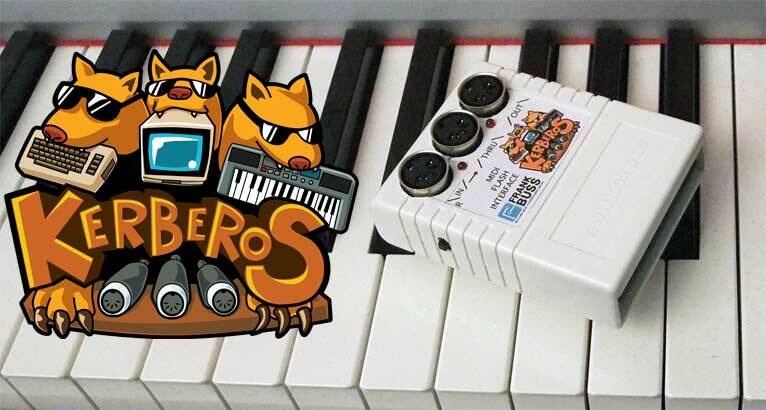 Kerberos is a MIDI interface for the C64 and C128 with integrated flash memory. With this cartridge for the expansion port you can connect MIDI devices like keyboards and synthesizer to your C64 or C128. The 2 MB integrated flash memory allows to save programs for quick start, which you can transfer over MIDI from a PC or Mac. The 128 kB integrated RAM can be used for programs as a memory extension. 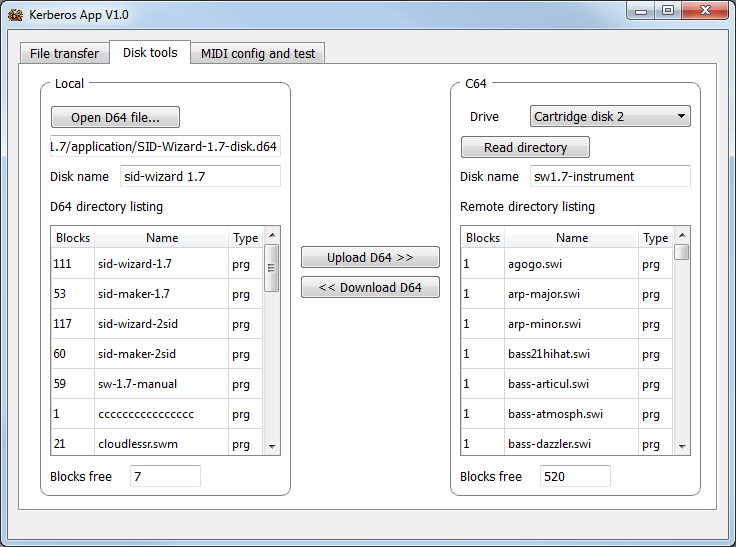 The cartridge provides an EasyFlash emulation as well, you can store an EasyFlash CRT image with up to 1 MB on it. Sequencer software Pro-16, by Steinberg (with kind permission of the publisher). Of course, Steinberg doesn't guarantee anything or support this software anymore. A short German review of the software on Youtube. You can download the software and the manual in PDF format here, too. a special MIDI version of the Cynthcart software, which Paul provided for free now, too, see the Cynthcart homepage, and you can download it here. 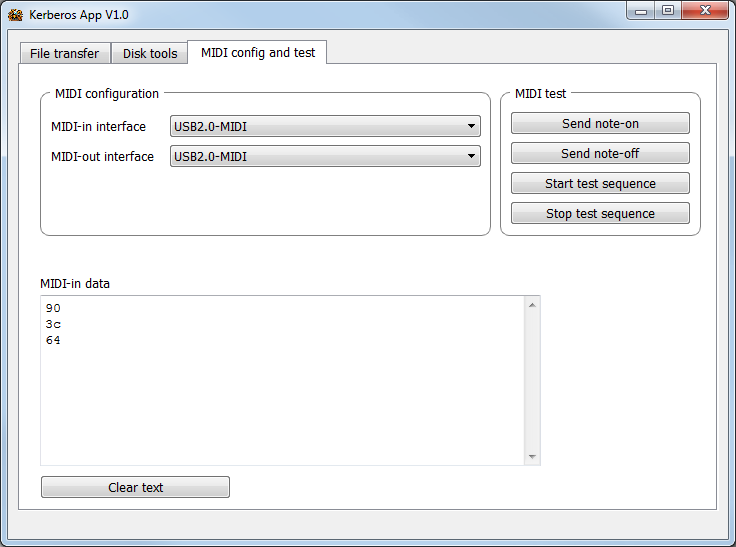 See here for a handy overview of the MIDI CC commands and the keyboard mapping. The project was successfully funded on Startnext (English page, German page). I plan to build more soon, you can follow me on Google Plus for announcements of it (and you'll get a few unrelated geeky posts), or subscribe the Kerberos MIDI Google Groups, where I'll announce it, too. The program to upload PRG files to the flash, Kerberos App, is available for PC (Windows) and Mac (tested on Mac OS X Yosemite, but should work with older versions, too). For bug reports you can use the GitHub "issues" system, or send me an eMail. If you want to discuss new features or write about what you do with your Kerberos cartridge, or read what other people do with it, visit the Kerberos MIDI Google Groups. The project is open source, all source code and the Eagle schematic are available on the GitHub project page.